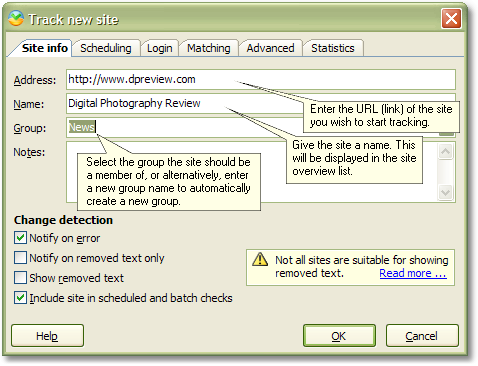 Track web page changes easily - monitor web pages and receive update notifications. Welcome to the UpdatePatrol Quick Start Guide. This guide will help you get started tracking web page changes in no time! The image below shows the main screen of UpdatePatrol. 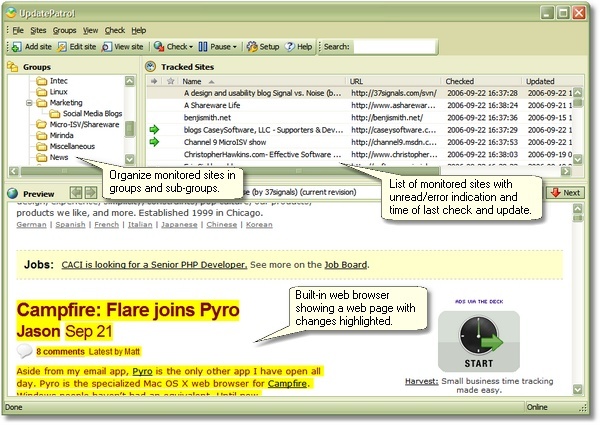 A monitored web page is currently shown in the built-in web browser and the detected changes are highlighted. On the left you have groups in which you can organize your tracked web sites, on the right you see the web sites that is included in the selected group. Simply click the group name in the group tree to display the web sites that belong to the group. Select one of the shared schedules from the dropdown menu or specify a schedule below that is only valid for this particular site. 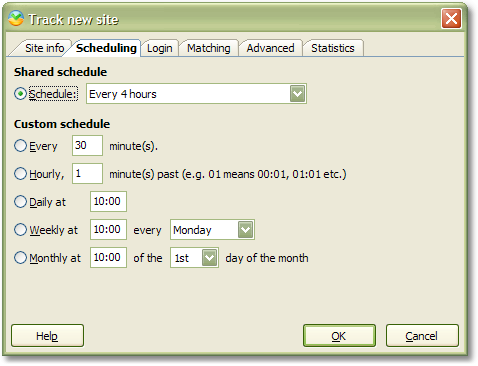 Using the shared schedules is recommended as this will make it easier to change the scheduling for all sites using a schedule later - you simply update the shared schedule and the changes immediately take effect for all sites using the schedule. Click the OK button and your new site is being monitored! Select Selected sites to check only those sites you have selected in the site list, or select All sites to immediately start checking all sites that you are monitoring for updates. This was a quick overview of some of the basic functions of UpdatePatrol. You should read the UpdatePatrol Online Manual for more comprehensive information about monitoring and tracking web page changes with UpdatePatrol.